DIETRICH, Charles Henry, a Senator from Nebraska; born in Aurora, Kane County, Ill., November 26, 1853; attended the public schools; employed as a clerk in a hardware store in St. Joseph, Mo. ; moved to Chicago, Ill., and engaged in the hardware business; moved to Deadwood, Dak. 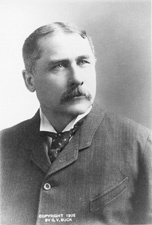 (now South Dakota), in 1875 and engaged in mercantile pursuits, delivering goods on pack animals through the Black Hills; located and owned the Aurora mine; settled in Hastings, Adams County, Nebr., in 1878 and engaged in mercantile pursuits and in banking; Governor of Nebraska, January to May 1901; elected on March 28, 1901, as a Republican to the United States Senate to fill the vacancy caused by the death of Monroe L. Hayward; qualified on May 1, 1901, when he resigned as governor, took his seat on December 2, 1901, and served May 1, 1901, to March 3, 1905; was not a candidate for reelection in 1904; retired in 1905; died in Hastings, Nebr., on April 10, 1924; interment in Parkview Cemetery.